Tragedy nearly struck on Tuesday when I took the stone to be sited. It was a dull, misty morning, rather chilled and English in feeling, and we arrived by the shore of the lake around 11.30. We met Terry and Bob there and the work began on drilling holes into the mother stone so that we could affix the migrating stone to it. Before long the heavens opened. It rained so hard I discovered very quickly that my waterproof jacket was not waterproof as water trickled down my back. The drilled holes filled up with water. The glue wouldn't go off. Bob looked at us through the grey sheeting downpour and declared that he couldn't carry on. Sue (from the Council) and I had to leave the stone with him hoping that the weather would clear in time for Bob to be able to complete the work. We drove off to an Op Shop (second hand shop) and bought new clothes. Even my knickers were wet from rain! I took the train back to Sydney not knowing what was going to happen. The launch was scheduled for the following day. People had taken time off work. My whole journey was suddenly in peril - or so it seemed. Wednesday brought fair weather. Sun and a gentle breeze. By 7 o'clock Bob had been out to the lake and fixed the stone in place. As with all mythical journeys, the biggest obstacles always arise just before you reach the destination. We had a fantastic time down by the lake welcoming the stone to its new home. Roger played trumpet and it was magnificent to hear music skimming out across the water. Tamryn read poetry, and then I read a couple of poems too. The stone looks fantastic. It was warm with sunshine and I felt totally satisfied and fulfilled. This whole project has been quite extraordinary from beginning to end - from dream to the realisation of that dream - from one place to another. I now have two days off. The sun is shining, my friends are nearby and I'm off to the beach to swim! Today is, predictably and wonderfully, a new day. Yesterday's sadness has dispersed and now there are just plenty of things to be doing. Perhaps it's always this way; just before we're about to make a big leap, or about to achieve something very special, all our worries and fears come crowding in and we feel inadequate and fear the worst. I know this often happens to me and, no matter how many times it happens, it always happens again. One lovely thing: Roger and Neil had a barbecue last night and invited lots of wonderful friends around. As the sky darkened and the nearly full moon rose above us we engaged in chatter and drinking and munching of prawns and sausages. 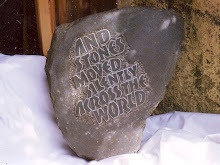 At one point Neil put the poem, And stones moved silently across the world, onto the c.d. player. By stanza three I was gazing up into the sky and what do you think I saw? A shooting star. Not just any old star though. This one blazed a trail, a line of bluish fire sparking out behind it. I'm off early tomorrow morning to Wollongong to meet Sue from the Council and Terry who's going to be bringing the mother stone and drilling holes. It will be the last journey that I make with the third migrating stone. From tomorrow, the stone will be settling into its new and cherished home. Today we are having a little celebration for the stone before it makes it's journey down to Kanahooka Point on Tuesday when it will be settled into its new home. Then, on Wednesday, we will be having a launch complete with readings of poems and a gathering of friends and local people and people from Wollongong Council. It's hard to believe that this journey is coming to an end. After three years in the planning and dreaming and working out there's now so little time before I have to say goodbye to the stone and clamber back onto an aeroplane that we fly me to England. I am a little sad today. Without exception people over here in Australia have been so kind and generous. In addition, I'm going to miss this stone in my life. Of course it will still be there, sunning itself by Lake Illawarra, but I'm going to be out of physical contact with it for years, possibly for the rest of my life. I couldn't be leaving it in a better place. But that doesn't stop a few tears from falling as I contemplate these last few days that we will spend together. I wonder if we aren't born with equal measures of sadness and joy; and that together they make the full and splendid spectrum of our feelings and deepen the quality of being alive. Today's tears fell under a sunny sky as I sat in the shade of a willow tree. The wind blew tiny shadows across me and even in the midst of feeling glum I couldn't help but see all the beauty around me too. Today is a great day. The stone and I took the train to Wollongong where we met Sue Bessell from the city council. I was so excited; after years of planning there we finally were, on the other side of the world and about to get in a car and drive to the place where the stone will be given a new home. I barely slept at all last night and then gave in around dawn and got up. It's strange to have waited so long for something and then when that something arrives it is both mundane and quite extraordinary at the same time. We took the train and then a bus and Sue met us at 11. Nothing could have prepared me for how beautiful the site it. Here the sun is shining and hot today so the sky is cobalt blue and there are no clouds. In response the water of Lake Illawarra was a deep translucent and slightly cornflowery blue. Rippled by a gentle and cool breeze. The lake is vast. There were birds of all sorts feasting there - heron, cormorants, shags, pelican. Apparently the prawns from this lake are the best that you can get. The site for the stone is at Kanahooka Point and it looks directly over to Koonawarra. Apparently there was a King Hooka - an aboriginal elder - after whom the Point is named. Who knows - perhaps it was him who spoke to me in my dreams and instructed me to bring a stone out here. When I was waiting to be picked up by Sue this morning I came to think of myself as a strange ambassador. One who comes bearing stones. I thought, is there a more precious gift that could be taken from one country to another, given from one community to another? After being at the lake we went off and chose a large slab of sandstone to which the migrating stone will be fixed next week. I grew up in Street, Somerset but i've lived all over the place. Paris, Glasgow, Iona, Norwich, Bristol. I mainly write poetry but have also written drama for Radio 4 and published short stories. Have also made artists books with Penelope Downes which was great fun, especially one called "in the time of crow".